Look at these hacks in Washington avoid questions on Venezuela from Max Blumenthal like he has the plague. Both parties are buying into this Venezuela BS. Shows without a doubt their complicity with the fossil fuel agenda. Any talk about dealing with Global Warming by these same politicians is irrelevant because most of them are being intravenously fed by oil and weapons production money for their campaigns. Their job is to keep the empire in tact - but actually it is collapsing. These corporate lackeys figure they can say most anything because the public is flying blind when it comes to Venezuela. 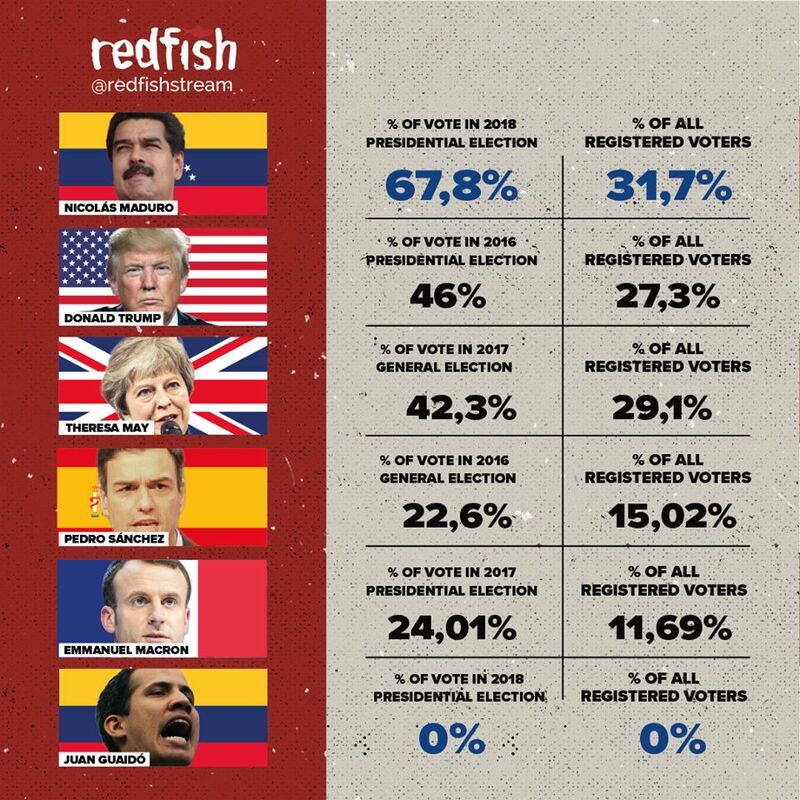 All day long on corporate media it is one crap story after the other - demonizing Maduro and linking him to the other guy who has already been demonized - Vladimir Putin. It's a Hollywood and Madison Avenue double-feature script that is read on every mainstream media outlet in the western world. 1984 is still here. A gathering in Hilo, Hawaii on January 25 concerning a commercial spaceport proposal for East Hawaiʻi stirred emotions inside the meeting and out. Terri Napeahi, a Keaukaha Action Network organizer, joined a group of sign waving residents in the parking lot of the Panaʻewa Gym, as representatives from the Alaska Aerospace Corporation met with area-residents inside the building. The company wants to develop a Pacific Spaceport Complex-Hawaii on W.H. Shipman land between Haʻena Beach and Pāpaʻi Bay. “I’m an ag farmer. I live there, and I’m concerned,” said Napheahi, who took issue with the meeting. A public informational meeting regarding the proposal is planned for February 6, at a location to be determined. Some years ago, during the George W. Bush administration, I watched a three-hour program on C-SPAN where then Naval War college teacher and author (Pentagon's New Map) Thomas Barnett gave a presentation. He was introduced as Donald Rumsfeld's strategy guy. Barnett stated that America's role under corporate globalization would be 'security export'. Other countries would make products using cheap labor and the US would fight wars to control the 'non-integrating gap' around the world in places where oil and other vital resources were available. These places, where the particular nations were not 'fully integrated' into the US-controlled 'new world order', would be taken down and occupied. This is what we see today in the Middle East, Central Asia, Africa and Latin America where the US-NATO are attempting to take full control of the planet on behalf of western corporate interests. Empire means endless war to stay in control. That means massive debt to pay for war and cutbacks in social and environmental spending. It means withdrawing from treaties as a key step in this strategy - create chaos and claim the right to occupy and 'stabilize'. They are only interested in stability when it means full corporate dominance. In the short video clip above retired Army Col. Lawrence Wilkerson (former chief of staff to Secretary of State Colin Powell) recounts attending a recent meeting of Democrat and Republican leaders who are totally committed to endless war. The clip speaks for itself. In The Peace Report’s latest interview, Will Griffin sits down with Paul Dobson from Venezuelanalysis.com to talk about the current struggle in the country. Paul gives us a very clear picture of the situation on the ground. He describes the forces on the left who support the Bolivarian Revolution and the Maduro government as well as the far-right forces from Washington, Venezuela, and Columbia who want to overthrow the government with coup attempts, street violence, and even assassination attempts. They also discuss how elections in Venezuela are a model for the world to follow, how the country has been the backbone of anti-imperialism for Latin America, and the support from the country’s rural countryside, specifically from Campesinos, who continue to fight for a sovereign and free Venezuela. Listen to "More Men to Mute and More 2020 Candidates" on Spreaker. On this episode of "By Any Means Necessary" hosts Eugene Puryear and Sean Blackmon are joined by James Early, Former Director of Cultural Heritage Policy at the Center for Folklife and Cultural Heritage at the Smithsonian Institution and board member of the Institute for Policy Studies, to talk about the ongoing crisis in Venezuela and the return of the Monroe Doctrine, the rise of the political right in Latin America, if President Obrador can save progressivism in Mexico, and the lack of a Progressive Democratic voice against US interventionism. In a special third segment (starts at 39:11 point) "By Any Means Necessary" is joined by Bruce Gagnon, Coordinator with Global Network Against Weapons & Nuclear Power in Space, to talk about America's ongoing efforts to develop a nuclear space force, if Democrats will halt military spending in exchange for funding a Green New Deal, and the need for nonviolent civic interruption to slow the military industrial complex. Later in the show, Eugene Puryear and Sean Blackmon are joined by Jacque Luqman of Luqman Nation to talk about former Starbuck's CEO Howard Schultz and Senator Bernie Sanders chances of running in the 2020 Presidential race, Rep. Hakeem Jeffries big talk and little action, Roger Stone lying to Congress, Tom Brokaw's racist comments on "Meet The Press", and new US sanctions aimed Venezuelan oils. Yesterday I posted this article Congresswoman who fixed Democratic primary for Clinton now ‘fixing’ democracy in Venezuela from RT on several Fazebook pages. At one of the pages a couple likely loyal Democrats asked the page moderators to remove the post because it was from RT. One woman wrote: Admins please don't allow posts from RT. We don't need to feed the Russian propaganda machine that aims to divide us. I responded by writing: Why are some folks so afraid of some Russian media? Have people been brainwashed so effectively that it makes you shudder? We should be reading media from all over the world. Don't we know that most western media (NY Times, Wash Post, TV networks) are corporate controlled media? We have to piece the truth together from many sources. I actually came away pretty depressed realizing that these woman are out trying to censor information about what is going on in our world because they've been told by their party leadership that Russia is evil. The article (which I urge you to read) actually quotes the Green Party candidate for president in 2018 Jill Stein (maybe that is in part why these Democratic Party women were upset) and journalist Glenn Greenwald. RT was actually just giving voice to American activists who are virtually never heard on mainstream western media. Needless to say it is quite alarming how quickly may so-called 'progressive' Democrats have swallowed the Russia demonization script and are quite ready to censor any media sources that don't give the party line that today is regularly heard on NPR, MSNBC, Washington Post and more. Just because some Democratic Party leaders are backing the coup d'etat in Venezuela many of these non-critical party faithful are following like lemmings as US foreign policy takes another dive over the cliff. They, who regularly hate Trump, are now supporting his coup attempt in Venezuela. The US's favorite puppet in Brazil, recently elected president Jail Balsonaro, hardly had time to put family photos on his new desk when he and his sons got hit with major corruption accusations. 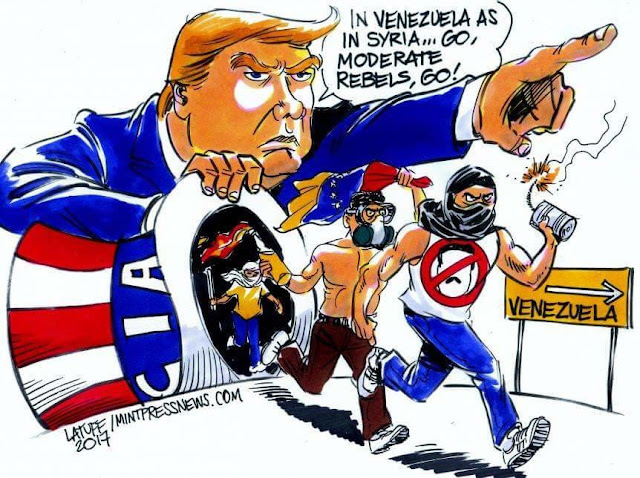 Washington has hoped that the fascist Balsonaro government will help in the current effort to topple the Maduro government in Venezuela. But now it appears that Balsonaro will be just a bit preoccupied with his own battle to remain in power. The arrogance of the Balsonaro family could lead to their downfall much sooner than anyone had ever imagined. Direct connections to murder, assassination and organized crime is not a great start. Thanks to Glenn Greenwald for this update from Brazil. Anti-government protests in Venezuela that seek regime change have been led by several individuals and organizations with close ties to the U.S. government. Leopoldo Lopez and Maria Corina Machado - two of the public leaders behind the violent protests that started in February (2014) – have long histories as collaborators, grantees and agents of Washington. The National Endowment for Democracy (NED) and the U.S. Agency for International Development (USAID) have channeled multi-million dollar funding to Lopez’s political parties Primero Justicia and Voluntad Popular, and Machado’s NGO Sumate and her electoral campaigns. Self-proclaimed Venezuelan interim president Juan Guaido has praised the Bank of England's reported refusal to allow Caracas to repatriate $1.2 billion worth of gold bullion, branding the move a "protection of assets." Caracas has been waging a losing battle to get its gold back from the UK since late last year, with the Bank of England repeatedly refusing its repatriation requests, according to media reports. Last week, British Foreign Secretary Jeremy Hunt joined Britain's US allies in backing Juan Guaido, calling him "the right person to take Venezuela forward" and making the return of Venezuela's gold all the more unlikely. Over the weekend, as if on cue, Guaido praised London's decision not to return the gold. The Israeli foreign ministry has reprimanded Ireland's ambassador Alison Kelly after the lower house of Irish parliament voted in favour of a bill that will ban the purchase of goods and services from the illegal Israeli settlements. The bill, put forward by independent Irish Senator Frances Black, seeks to ban the import or sale of goods produced by settlements in the occupied West Bank. In the aftermath, Senator Black tweeted, "Ireland will always stand for international law + human rights, & we're one step closer to making history. Onwards!" The bill would still go through several more stages of review and amendment before it is signed into law, but it is backed by all of Ireland's opposition groups, including the Fianna Fail, Sinn Fein, Labour, the Green Party, the independents and the Socialist Democrats. The US has helped 40 ISIS commanders escape from a Taliban prison in Badghis, in northwestern Afghanistan, the Iranian news agency Tasnim reported. The 40 inmates, all foreigners, were taken by helicopter to an unspecified location after US troops attacked the prison and killed all security guards two weeks ago. The agency, which plans to disclose more details of this operation soon, said the deputy head of the Badghis provincial council, Abdullah Afzali, confirmed the facts. According to the Russian Foreign Ministry....the US has links with ISIS. The Foreign Ministry also reported that US special forces may have participated in the seizure of prison documents to prevent leakage of information about the sponsors of the terrorists. The Alaska Aerospace Corporation (AAC) wants to develop a Pacific Spaceport Complex-Hawaii, and is currently assessing land in Hawaii as a possible location. The corporation told a private meeting of selected residents in Hawaii that it does not plan on doing military contract work at the potential launch site. Instead, the focus will be on commercial satellite launches. This is the same thing that the AAC told people on Kodiak Island, Alaska some years ago when they built a launch site there. In fact, every launch from Kodiak Island has been a military Star Wars test. Folks in Hawaii had better watch out for the AAC's forked tongue.